About two dozen activists from all over the U.S. protested at Creech that day. 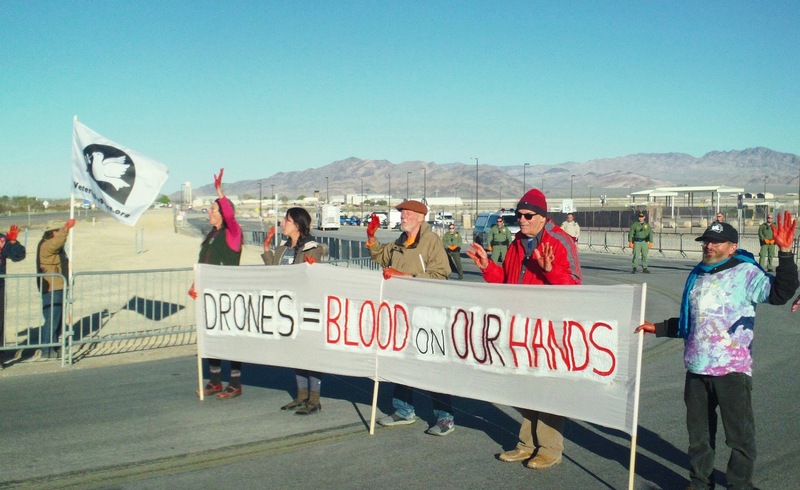 The drone base has been the target of five days of protests which started on April 1. Anti-war activists from throughout the U.S. are holding twice daily actions – 6:30 a.m. to 8:30 a.m. and 3:30 p.m. to 5:30 p.m. during commute hours in and out of the Southeast gate. This was the 5th annual twice-yearly national mobilization against drone warfare at Creech, and the 10th anniversary year that San Francisco CODEPINK has been organizing protests against these inhumane remote killings that are controlled from Creech Air Force Base. The drone center at Creech Air Force Base is a key control center in the covert U.S targeted assassination program, using unmanned, remotely controlled drones. At Creech, both the Pentagon and the CIA use the U.S. Air Force to execute their targeted assassinations around the globe. Under President Trump’s administration, the use of drones to kill military targets has tripled in frequency according to some estimates, but caution has decreased. Just this year President Trump has loosened the oversight of these secret killings by eliminating the requirement placed by the Obama administration to account for civilian deaths in drone attacks. Tues. (4/2) AM: Funeral Procession with coffins to mourn the deaths of victims of US drone strikes and all U.S. air strikes around the globe. A somber funeral procession along highway 95 at the entrance to Creech: Dressed in black, with white masks, carrying coffins with labels of each of the 7 + countries the US is bombing. “Victims of Terror” Altar: with candles, flowers and names and photos of some of the child and adult victims of U.S. drone attacks, including Abdulrahman al-Awlaki, the 16 yr old American boy killed by a U.S. drone missile in Yemen in 2011. Wed. (4/3) AM: ARRESTS EXPECTED. Nonviolent Civil Resistance, where activists will risk arrest in order to temporarily halt the “killing business as usual” at Creech AFB. The action will also be a solidarity action for Venezuela, which is currently being threatened by a possible U.S. Coup. Messages: “U.S. Bloody Hands OFF Venezuela!” “Let Venezuela Live.” “Not One More War, Not One More Regime Change.” In November of last year, Venezuelan President, Juan Maduro, narrowly missed an attempted drone attack on his life. Many suspect the U.S. was involved in that failed assassination attack. Thurs. (4/4) AM: NO to NATO, YES to PEACE. On the 70th Anniversary year of the founding of NATO, peace activists are calling for worldwide actions against the western military conglomerate known as NATO, that has led aggressive wars on numerous countries around the world, causing immeasurable suffering and death for too many years. This vigil will be a solidarity action in support of this worldwide call to action. Fri. (4/5) FLY A KITE, NOT A DRONE. In honor of the people of Afghanistan who have suffered horribly from nearly 17 years of U.S. occupation. The western world has not reasonably kept track of the number of lives lost, and number of injuries caused by U.S. drones and conventional weapons used in Afghanistan. However, Afghanistan is “The most droned place in the world.” Since kite-flying is a favorite past-time in their culture, our last morning vigil will fill the skies near Creech Air Force Base with color and joy, reminding U.S. troops that the way of peace is one that builds community and love, and joy. There is a better way than the way of war….one that is best for all of us.